Hi everyone. 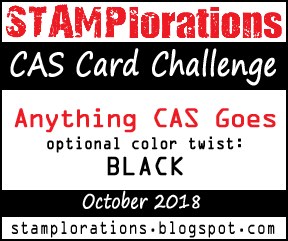 Playing along with the STAMPlorations CAS Challenge that has just started up after taking the summer off. My dear friend Nancy (scandinancy creates) has just joined the Design Team, so I wanted to play along. I'm so happy for her! Congrats Nancy! The card above is one of my favourite images from STAMPlorations called Framed Dahlias. There is also a Framed Rose that I have too and it's just as beautiful. I stamped the image in Silver Delicata ink and heat embossed in silver. I watercolour using three colours of Distress Inks (Wilted Violet, Chipped Sapphire, Black Soot). I'm happy with how these purple dahlias pop against the black background. I splattered my card front with diluted black ink, stamped the sentiment in purple, and popped up the fussy-cut panel with foam to add dimension. I hope you'll check out the challenge and come play along! You don't have to use STAMPlorations stamps to play. Such gorgeous purple dahlias! Beautiful embossing! And, love the purple against the black for your lovely card, Loll! WOW! I've never successfully colored or painted a black background but this is incredible! What wonderful coverage. Love the dahlias embossed in silver and so perfectly painted. This is beautiful, Loll! The black background really makes the gorgeous purple dahlias pop, Loll. Love the silver embossing against the black background making that beautifully coloured dahlia stand out. 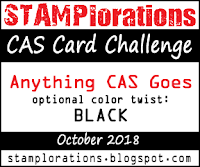 Funny I have a few of these stamps out that I was looking to use for the CAS Watercolour Challenge. Great splatters. You may see a 'case' card coming if that is okay with you. Stunning Loll, your black background against the white is wow! and your dahlias are so pretty. Beautiful Dahlias, Loll! I love how you stamped them in silver and the striking colors you chose for the petals really pop against the black background! Love your splatters, too! Beautiful purple flowers, Loll! 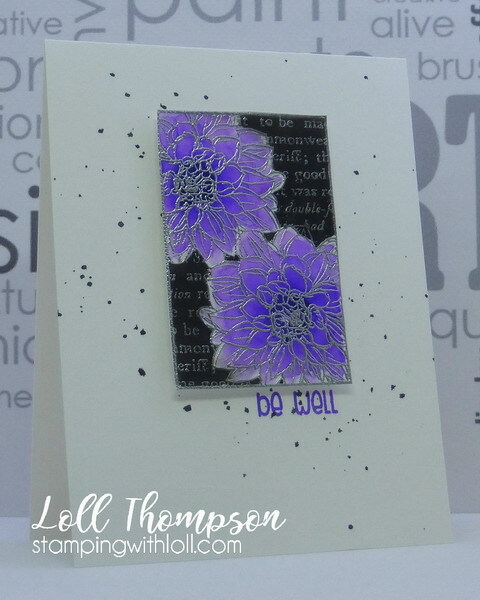 I love how the purple pops against the silver embossing and black background! Stunning purple dahlias and beautiful watercoloring. I love the sentiment stamped in purple. Every detail of this card is perfect and perfectly complements the whole. I love the delicate color of dahlia, the deep blacks of the printed background and beautiful splashing. Another amazing card, such a beautiful inspiration, Loll. Stunning purple Dahlias, Loll! The flowers beautifully pop against the black background. The color of the embossing is a great choice. It's so refreshing to see the STAMPlorations product in YOUR style!